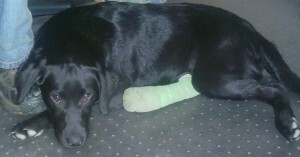 5 month old Labrador puppy Willow cut her paw! Yesterday, (25th June 2012) Willow was playing in the pond in Abington Park when she came hobbling back to me with bright red blood spurting out of her paw. I scooped her up and we hurried to the vets. Once they had got the mud off her they saw she had a nasty cut between her pads on her right hind leg. They set about cleaning and dressing the wound whilst we waited anxiously with the other dogs. We must really have looked a sight- covered in mud and blood and pacing about for what seemed an eternity (but was really about half an hour). Suddenly little Willow rushed over to us as best she could with a big vibrant green bandage which looked a bit like a plaster! Update: Willow went to the vets for a bandage change 2 days after her accident and the vet was very impressed, saying the cut had healed twice as fast as she expected! Willow didn’t need a second bandage and she’s now pretty much back to her bouncy self. Maybe her super fast recovery is due to our biologically appropriate real food (barf) diet, which Willow has had all her life, since her conception. More about diet, health and first aid here, our training tips and dog ownership handy hints here – and it you’d like to contact us, please click here.